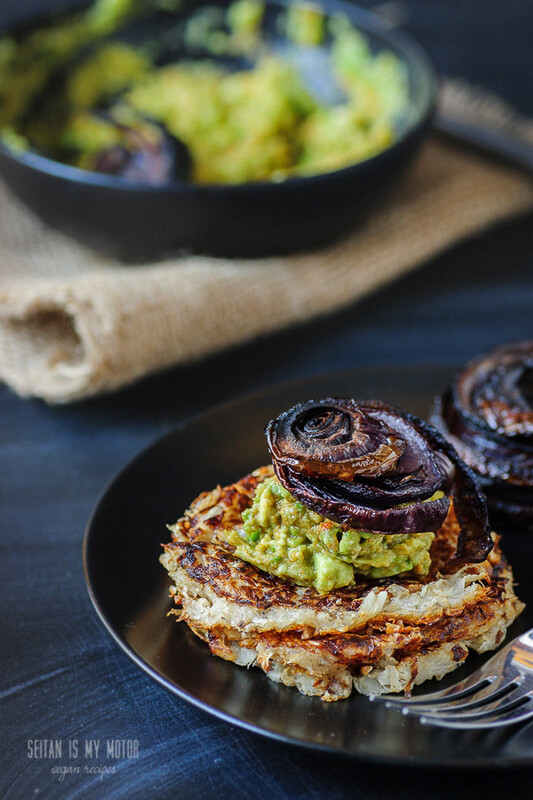 I still remember the impressive roesti I used to order at a vegetarian restaurant in Leipzig: It was a huge, crispy potato fritter topped with spiralised, deep fried onions, and guacamole. Even though we moved to Dresden a long time ago and the restaurant closed a couple of years back I will never forget this dish. To me that restaurant was a special place. It was not only because I could chose whatever I wanted from the menu. I think that at this restaurant I realised that vegetarian cuisine can be an independent cuisine with food that is interesting, unique, satisfying. A cuisine not about the meat that’s missing but about different ingredients and tastes. In my hometown I was used to the menus of restaurants specialising in German cuisine. Going to a restaurant meant a lot of sweating and being good at finding those two or three hidden vegetarian dishes somewhere on page four or five, right after 20 varieties of schnitzel. So when I went to this place in Leipzig I was very exited and at the same time very overwhelmed. Thankfully the menu did not only list fancy items. They also had a couple of basic dishes that I could identify as something I knew. Roesti, a large potato fritter, was one of them. The dish was made from only a couple of simple and cheap staples like potatoes and onions. Still it was prepared so well and tasted so perfect, that I will never forget this meal. I admit that my own roesti version will never be as good as the one I used to get at this vegetarian restaurant in Leipzig. With a simple trick I was still able to turn this meal into something special for me. And I did save a root vegetable from becoming a stock ingredient. Don’t misunderstand me, homemade vegetable stock is something awesome. But that poor celeriac needs more attention. It’s a fantastic starchy vegetable with basically the same characteristics as potatoes but with much more flavour. You can cut it into vegetable fries or mash it and you can even turn it into a schnitzel. Of course you could make these fritters with other root vegetables, too. Or mix up the ingredients and use potatoes and celeriac or celeriac and beets. Carrots would also be awesome in this. The only thing you have to keep in mind is to be very careful and patient while frying the roesti. Traditionally these are bigger and they are cooked with a plate covering them to make them cook faster at a low temperature. I made smaller versions and simply used a very large spatula to flip them. To make the onions: Preheat the oven to 200°C (400°F) and line a baking sheet with parchment paper. Cut the onion into 1/2 cm (1/4 inch) thick slices and place them on the baking sheet. Brush with oil and sprinkle with salt. Bake for 13-15 minutes or until the onions have browned. To make the fritters: Place all ingredients in a bowl and mix well. Preheat a non-stick pan to medium temperature and add about 1 tablespoon of oil for frying. Use about 2 tablespoons of the celeriac mixture per fritter and place it in the pan. Use a spoon to press down the celeriac and push the edges together to shape the fritters. Cook for about 10 minutes. (Lower the heat if the fritters brown too fast.) Use a spatula the size of the fritter and carefully flip it. If it breaks apart just press and push it again. Cook for another five minutes. Make sure to add more oil after you’ve flipped the fritters and when you add a new batch of fritters to the pan. Prepare the mash while the fritters are cooking. To make the mash: Mash the avocado with a fork, add remaining ingredients and mix well. Serve the fritters with mash and top with onions. First thougt when i read your post: sounds like “the kitchen”. I used to love this restaurant, too.